Keep warm in fashionable kid's jackets from GearBuyer. Browser warm and stylish kid's jackets. 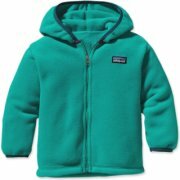 Patagonia Baby Down Sweater - Think of Patagonia's Baby Down Sweater as your baby's on-the-go down comforter. This easy-to-layer essential wraps them in soft warmth yet blocks wind and water when conditions get dicey. The Patagonia Baby Down Sweater is made of a lightweight and water-resistant polyester shell with a Deluge® DWR (durable water repellent) finish, and insulated with highly compressible 600-fill-power premium European goose down. Relaxed fit. Back elastic secures the fit. Easy to layerOuter shell constructed of 20 denier polyester mini-ripstop fabric. 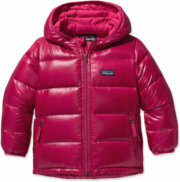 Patagonia Baby Reversible Puff-Ball Jacket - The Baby Reversible Puff-Ball Jacket by Patagonia. 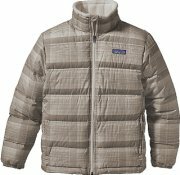 Patagonia's fast-drying Baby Reversible Puff-Ball Jacket is made of durable, weather-resistant, all-recycled polyester shell fabric with compressible, high-loft 100-g Thermogreen insulation; handwarmer pockets on the non-quilted side. 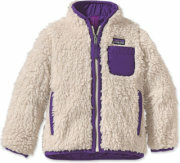 FEATURES of the Patagonia Baby Reversible Puff-Ball Jacket. SPECIFICATIONS of the Patagonia Baby Reversible Puff-Ball Jacket. Relaxed fithand warmer pockets on non-quilted sideReversible shell fabric and quilting offers style optionsSpandex binding on waist, cuffs and hood holds shapeThree-panel hood is contoured for better coverageLightweight, wind-resistant shell fabric is treated with a Deluge® DWR finish; 100-g Thermogreen® insulation stays warm even when wetZipper garage protects neck and chinMade in China. 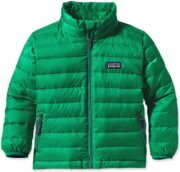 Patagonia Baby Reversible Tribbles Jacket - The Baby Reversible Tribbles Jacket, made with a wind- and water-resistant 100% recycled polyester fabric and warm, compressible 100-g Thermogreen® insulation reverses to a plush high-pile fleece side. The only trouble with Tribbles is deciding which fabric, furry or slick, to wear on the outside. This reversible wind-and-weather-resistant jacket is made of a smooth, durable recycled polyester shell with a Deluge® DWR (durable water repellent) finish to shed moisture. Patagonia Baby Synchilla Cardigan - Patagonia Baby Synchilla Cardigan. This warm cardigan made of soft recycled polyester fleece has elastic binding around the hood for a secure fit. This garment has a Relaxed Fit. Springtime is a good time to keep your babes in the hoods. Ultrasoft and warm, the Synchilla Cardigan is made of 100% polyester (Solids only: 85% recycled) double-faced fleece that is durable and easy to care for. The full-length zipper is backed by a fleece wind flap, and spandex binding at the hood opening and cuffs seals out chilly drafts. 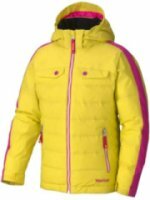 Marmot Zermatt Down Jacket - Impressing any and all, she’ll be thrilled to wear the Girl’s Zermatt Jacket by Marmot all winter longer. Whether zipping down the slopes or playing in the snow, know she’ll be warm with premium 700-filled water resistant down. Marmot’s own MemBrain fabric offers two layers of protection and is both waterproof and breathable in design. 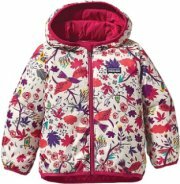 A snap off hood and colourful fabrics offers versatility to any picky princess while comfort reins high with quilted side panels and soft collared linings. 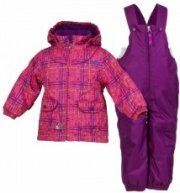 Jupa Alisa Snowsuit Set - The Alisa is a cute, comfortable snowsuit that keeps your child warm and dry even after a full day playing in the snow. 140g of Thermadux insulation in the body keeps her toasty warm, and yet the synthetic lining and 5000gsm/24h breathability lets her run inside for a cocoa break without overheating. Reinforced knees and seat as well as a sturdy YKK zipper make the Alisa durable enough for multiple seasons. 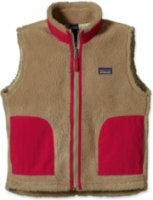 Patagonia Down Sweater Vest - The Patagonia Kids' Down Sweater Vest. Our easy-to-layer Kids' Down Sweater Vest, made of a wind- and water-resistant polyester ripstop fabric is insulated with warm and compressible high-loft 600-fill-power premium European goose down. FEATURES of the Patagonia Kids' Down Sweater Vest. SPECIFICATIONS of the Patagonia Kids' Down Sweater Vest. Relaxed fitInternal draw cord at hemComfortable quilt-through constructionHand-me-down ID labelLightweight and highly compressible 600-fill-power premium European goose downFull-length zipper with zipper garage and wind flapLightweight, windproof polyester shell has high tear-strength, with a Deluge® DWR (durable water repellent) finishTwo hand warmer pockets with reflective zipper pulls. 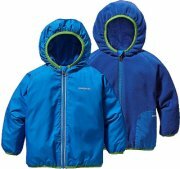 Helly Hansen Powder INS Parka - DECENT FEATURES of the Helly Hansen Kids' Powder INS Parka. The SPECS of the Helly Hansen Kids' Powder INS Parka. Insulated 2-layer construction3/4 length regular fitDetachable hoodWaterproof, windproof and breathableFully seam sealedYKK zippersInternal pocketsMultiple exterior pocketsDetachable faux furAdjustable cuffs100% PolyamideReflective elementsArticulated arms and elbowsHelly Tech ProtectionWarm Core by Prim aloft. 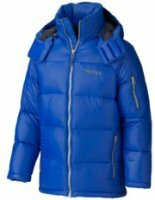 Marmot Stockholm Jacket - Marmot Men's Stockholm JR Jacket. For hard-chargers that never let a little cold weather get in the way of their good time: the Stockholm JR Jacket is solid winter battle gear with plenty of big-city savvy. High cire fabric gleams in the sun as it reigns in the warmth of the potent 700-fill water-resistant power down insulation. Micro fleece linings, handy pockets, and showbiz zippers complete the package. Lightweight High Cire Down Proof Fabric. 700 Fill Power Down with Down Defender. 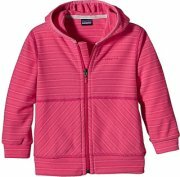 Patagonia Baby Hi-Loft Down Sweater Hoody - The Baby Hi-Loft Down Sweater Hoody is Patagonia's warmest winter jacket available for the little one in your family. The wind and water resistant shell includes a durable water repellent, which means if a few snowflakes fall onto his or her arm, it won't soak in, but shed it right off as it melts. The elastic hem, hood, & cuffs will help seal out the cold without constricting any precious tiny human parts. 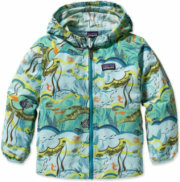 Patagonia Baby Torrentshell Jacket - Patagonia Baby Torrentshell Jacket. 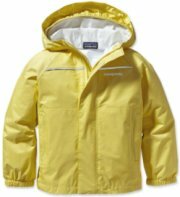 An H2NoPerformance Standard rain jacket for toddlers made of waterproof/breathable 2.5-layer nylon that keeps your puddle jumper dry in the wettest weather. Bridalveil Fall at full spring throttle roars like some mythic beast while its drenching spray rains onto the valley floor. The Torrentshell Jacket – now available for our tiniest funhogs – keeps babies dry amid the spectacle. Made of H2NoPerformance Standard 2.5-layer, 2.6-oz 50-denier 100% nylon ripstop, this unflappable baby rain jacket has a waterproof/breathable barrier, is fully seam-sealed and has a DelugeDWR (durable water repellent) finish. 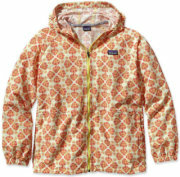 Patagonia Baby Duality Jacket - FEATURES of the Patagonia Baby Duality Jacket. SPECIFICATIONS of the Patagonia Baby Duality Jacket. Relaxed fitReverses from a water-and wind-resistant Deluge DWR treated polyester shell side to a cozy micro denier fleece side both recycledFleece side has hand warmer pockets and elbow patchesSpandex binding on cuffs, waist and hood holds shape and seals out coldReflective logo on both sides and reflective zipper on shell side. Patagonia Baby Down Sweater Vest - Core warmth for babies. The Baby Down Sweater Vest is made of a wind- and water-resistant polyester ripstop fabric insulated with 600-fill-power goose down. Ultralight, cold-season insulation for serene trail walks with dad or epic stroller wheelies with mom. Patagonia's Down Sweater Vest buffers young bellies in an easy-to-layer construction that combines a 1.4-oz 20-denier polyester mini-ripstop shell with a 2-oz 100% polyester plain weave lining, both treated with a Deluge® DWR (durable water repellent) finish to provide wind- and water-protection. Canada Goose Chilliwack Bomber Jacket ( - The Canada Goose Chilliwack Bomber Jacket is about the warmest jacket a kid can have. Designed in the northern-most regions of Canada and insulated with 625-fill duck down, your child is guaranteed to stay cozy in the worst weather imaginable. The exterior fabric on the Chilliwack Jacket is called Arctic-Tech, and it provides protection against the water and wind. It's also extremely durable so even the most adventurous child won't tear it up. 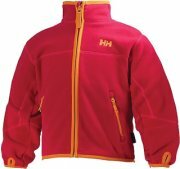 Helly Hansen Fleece Jacket - FEATURES of the Helly Hansen Kids' Fleece Jacket. SPECIFICATIONS of the Helly Hansen Kids' Fleece Jacket. Polartec classic 200 gram Fleece100% PolyesterRegular fitYKK zippersZipped pocketsFull front zipperArticulated arms and elbowsThumb holeContrast detailing. 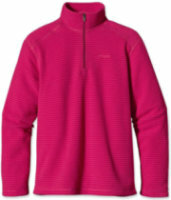 Patagonia Micro D Zip-Neck - The Patagonia Kids’ Micro D Zip-Neck is a fleece zip neck for winter layering. The soft fleece wicks moisture away from young skin to keep them dry while working hard on their new skills at the bunny hill. The new stripe pattern looks good while running around the lodge and warming up with a cup of hot chocolate. A ¼ zip vents extra heat without having to take it off. 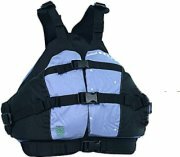 Astral Buoyancy Otter PFD - Astral Otter Youth Lifejacket - The Astral Otter Youth Lifejacket is extremely comfortable for kids and constructed with the same quality details of Astral's adult lifejackets. It is filled with an organic Kapok that is very soft and easily conforms to the child's body. This is a jacket that kids will want to wear all day! For kayakers, sailors, swimmers, etc. Shoulder adjustments are easy to reach and adjust for a complete custom fit.